When it comes to telecoms giant Vodafone (LON: VOD) you can easily pin down the main reasons why folks might want to own it. With a $70 billion market-cap and a household name a cursory analysis of its history and operations looks enough to add it to the blue chip buy-and-forget bin. The second, and probably more relevant reason these days, is because of the dividend: as far as I can see it has raised its distribution in every year since it floated in fiscal year 1988/1989. Perhaps more significantly the average yield on Vodafone stock has been around 5.5% since 2007, which makes it a pretty attractive proposition to anyone looking for quality dividends in a low interest rate environment. We’ve got a household name, a great dividend growth history and a nice juicy starting yield to top it off. What’s not to like? Unfortunately there’s a few very good reasons to be cautious on Vodafone stock right now. First up is the earnings and cash flow situation. As far as I can see the company is struggling to generate the earnings required to sustain its dividend obligations. On a cash flow basis you’d have to go back pretty far to find the last time Vodafone managed to convert all its profit into free cash flow. Since the start of fiscal year 2013 Vodafone has generated around £4.5 billion in free cash flow (once you include license and spectrum costs) whilst paying out £12 billion in ordinary dividends. Granted, Project Spring – Vodafone’s multi-year plan to upgrade its European and emerging market infrastructure – was obviously going to require a lot of extra capital expenditure in the short-run, but even excluding this Vodafone struggles to generate the earnings and free cash flow required to maintain growing dividend payments. The second issue comes down to the balance sheet. Originally when the company sold its 45% stake in Verizon Wireless for $130 billion back in 2013 it was going to use the proceeds for three things: Project Spring and infrastructure upgrades; cash to shareholders; and, finally, to pay down debt. Initially net debt on the balance sheet did reduce substantially from around €30 billion to the €15 billion mark (the company recently switched to reporting in euro rather than pounds hence the currency jumps here). It has since increased to over €40 billion. When you consider that free cash flow is struggling to cover the dividend then that burden looks considerable. Low interests rates are helping, but on a fundamental basis free cash flow needs to rise quite considerably going forward. Third, and finally, we have the current valuation. For fiscal year 2017 the company will earn around €1.75 billion; a figure which puts the stock at 38x annual earnings at the current implied market value. So what gives? It’s not like we can expect great growth for such a large telecom company. Even if Vodafone generated the €4 billion in free cash flow it needs to cover its dividend it still wouldn’t be all that cheap. It looks like the current yield is the one thing keeping the share price elevated. That’s not necessarily a bad thing when it comes to blue chips by the way; indeed the “yield floor” is what can make them attractive stocks to own in the first place. But you don’t need me to tell you that a dividend yield which is consistently higher than the earnings yield is unsustainable. Just be wary that a dividend cut would probably send the shares down sharply given the current elevated valuation. On the plus side of things the company announced that Vodafone India will merge with its competitor Idea Cellular; a move which will create the largest telecoms operator in the country. This will boost cost savings and should also lower capex sending and net debt as well. In addition the move to offer so called “quad-play” in the stable European markets – i.e. mobile, fixed line, broadband and TV all in a bundle – should also lock in customers and stabilize cash flows. Is that enough to get the business on track again? Maybe, but the thing with Vodafone is that there appears to be much better options elsewhere. Let’s say you’re an American investor and you’ve got room in your portfolio for a stodgy telecom stock paying a good divided. What’s going to make you plump for Vodafone stock over AT&T? Granted, Vodafone’s current yield is around one percentage point higher but current yield on its own clearly isn’t enough. AT&T generates much better free cash flow and its underlying business is in much stronger position. With the acquisition of DirecTV, and the possible upcoming one of Time Warner, it will be a giant spanning telecoms and media delivery & content. More importantly it trades at much healthier 14x forward earnings. Like Vodafone the debt is something to keep an eye on though. A similar question could be put to those of us on this side of the pond. What makes Vodafone a better stock than say BT right now? The latter is clearly not without its problems, yet BT still generates around £2.5 billion in free cashflow. 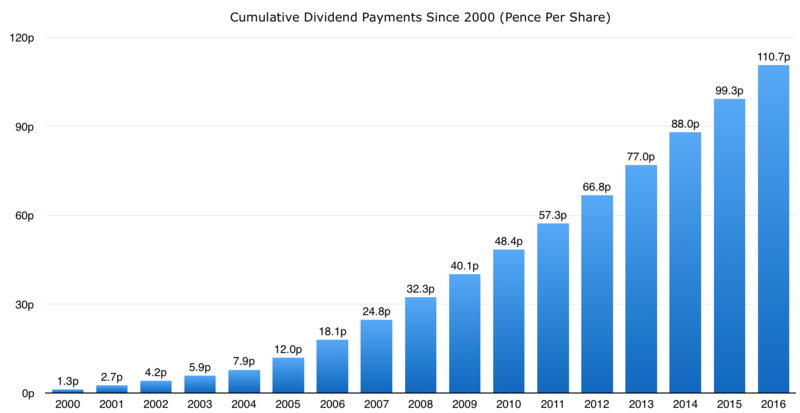 With annual dividend commitments of £1 billion that’s a very nice cushion. The Opeanreach asset and moves into television with BT Sport ensure said cashflows are pretty stable. As with AT&T it’s current valuation is also much more attractive at 11x forward earnings along with a 4.5% dividend. All-in-all I think investors should be cautious on Vodafone right now. Now might not be the best time to commit a large chunk of capital here for a cocktail of reasons. Fundamentally the company is struggling to generate cashflow in the amounts required to cover its dividend obligations to shareholders. Its valuation is also appears pretty extreme barring either stellar growth and/or a marked improvement in its underlying profitability. Furthermore, there appear to be far better options out there offering similar yields. 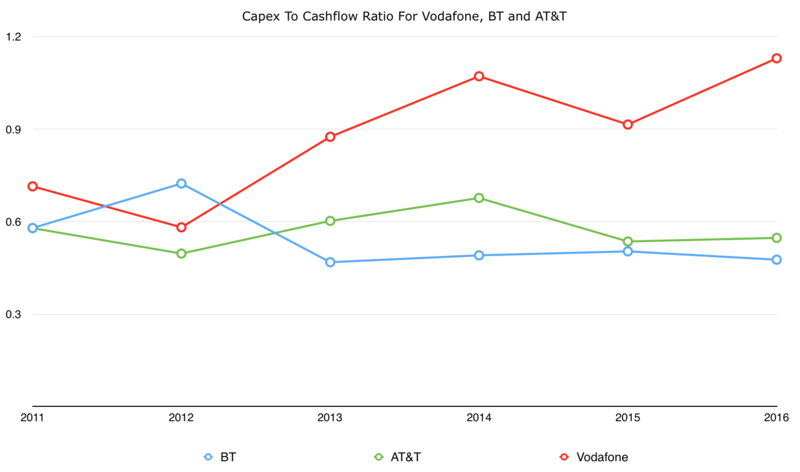 Both AT&T and BT have more diversified operations and enjoy higher quality cashflows. Most importantly though they just look far better value right now.